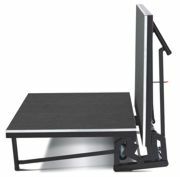 Staging Concepts Inc. has designed and manufactured the EZ Stage®—a new, mobile, durable, compact stage that can be simply folded up and easily rolled into storage on its wheels by just one person. When folded, the portable EZ Stage can be tucked away into a minimal storage space and conveniently retrieved and set up at a moment's notice without any tools. The stage incorporates advanced design techniques for maximum durability and longevity. The platform can be easily unfolded from storage position to stage configuration. Newstripe announced the improved Eco-Liner II gasoline-powered field marker, now with the Qwik-Set trigger, hands-free spray trigger. Qwik-Set now offers the convenience of activating the spray trigger just once without having to continually squeeze the trigger while striping. Qwik-Set reduces hand strain and the fatigue associated with extended striping. Eco-Liner II incorporates a direct-drive industrial-grade diaphragm pump coupled to a 3.5-hp engine providing paint pressure up to 60 psi. Along with the original battery-operated Eco-Liner, all models use a standard 5-gallon pail as the paint tank, eliminating the cleanup and safety concerns of pressurized paint tanks. The SeaKlear PRS product has received authorization and initial certification through the Water Quality Association (WQA) and is now Gold Seal Certified, which means that the product has been independently tested and certified by the WQA in accordance with "Drinking Water Treatment Chemicals – Health Effects NSF/ANSI 60." This certification along with the NSF 60 certification received by the product last month makes this product available for use in states that require this standard for recreational water, including swimming pools, waterparks, spas and splash play areas. SeaKlear PRS also is the first EPA-approved clarifier system for trapping Cryptosporidium in pool and spa filters. 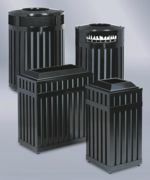 United Receptacle introduced Avenue by Howard Products steel outdoor receptacles. These new receptacles will add a touch of old-world charm to your landscape. A design inspired by elegant wrought iron of yesteryear, steel mesh detailing and strong vertical rails create a charming yet avant-garde effect. Four models ranging in size from 16 to 46-gallon capacities will fit a variety of applications. The slender rectangular model is suitable for city street or park walkways, providing a large-capacity receptacle while utilizing minimum sidewalk space. The steel construction and Uni-Koat powder-coat finish will endure harsh weather conditions. Available in custom colors and with custom graphic options. CarpeTile Sport looks like commercial carpet, but is actually an antimicrobial polypropylene fiber tile that has all of the design flexibility of commercial carpet, but without all the liabilities. Because of its construction, it is impervious to staining, absorption of perspiration and indenting under heavy machinery. Its needle-punch construction also prevents the carpet from fraying, zippering or releasing fibers that can get caught in the machinery of your expensive equipment. Maintenance is easy, using the same procedures you would use with commercial carpet. CarpeTiles are available in four stock colors and are warranted for seven years. Water Tech introduced the new CatfishTM PPV (Portable Pool Vac)—an affordable pool cleaner for larger commercial spas and hot tubs. 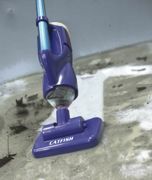 The CatfishTM PPV is a portable, battery-operated, rechargeable, extended-reach pool cleaner that cleans every area (floors, walls, stairs and steps, in and around ladders, drains, corners, etc. ), is lightweight and maintenance-free. The CatfishTM PPV has a high-flow vacuum motor and rechargeable battery. The unit offers an "on-board" debris catcher with a reusable, all-purpose filter bag and comes with a vacuum head equipped with wheels and brushes for a variety of surfaces. Aerobic Club Steps are no longer just for step class. These days they perform double duty (and sometimes painfully so) as an exercise platform and bench for strength training, core development and flexibility. Kneeling or lying on a step can be particularly uncomfortable, which is why Power Systems created the Mat for Step. This thick 3/8-inch ribbed foam mat goes on top of the step platform to cushion the body while performing exercises that involve kneeling, sitting or lying on the step. It is not designed to be used while stepping or standing on the platform. The Mat for Step fits the Original Health Club Step® and Reebok Step®. The MarkSmart MultiGuide is a multipurpose field marking guide created to facilitate quick, accurate location and painting of the recently mandated hash marks on flag-football fields at the collegiate level. It also serves to be a good tool to create or "prove" 90-degree corners on football, soccer or any athletic field. Additionally, the MarkSmart Guide serves to accurately locate or verify 5-, 10-, 20- or greater yard increments on any athletic field. The easy-to-use, economical guide is made with durable materials for long life and features a positioning grommet every 36 inches. The MarkSmart MultiGuide is sold in 15- or 20-yard sets to match most field marking needs.